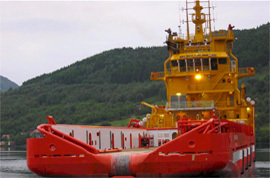 We deliver a variation sizes of stern rollers. The sternrollers are equipped with low friction bearings. 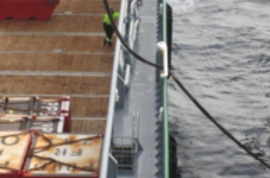 Towing fairlead fitted into towing strongpoint on deck to ease maneuvering during tow. The blocks are delivered in 3 different sizes. Patent pending. 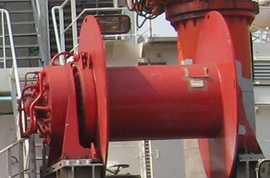 Safe hose handling system is designed to make the operation of transfer of bunker , mud hoses to a platform supply vessel more safe and more efficient. Patented. Storage drums for mooring ropes and spare tow line. The storage drums can be delivered with tension mode to ease spooling and required back tension on wire. 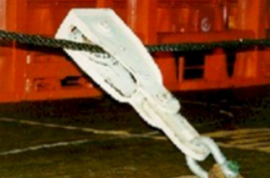 Cargo secure winches for handling deck cargo on platform supply vessels. 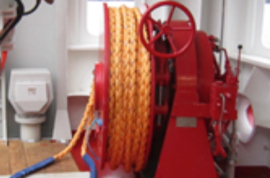 The winches have free coupling for easy payout of wire rope. 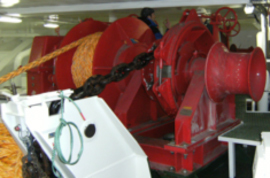 For supply vessels we deliver cargo handling winches and strapping winches. A-frame for handling rig anchors and reduce stress on rig anchor deployment. KARM wire spooling device is spooling device to spool of coils of pennant wire. This is designed compact to be placed on deck. The device can be delivered with different spooling tension.